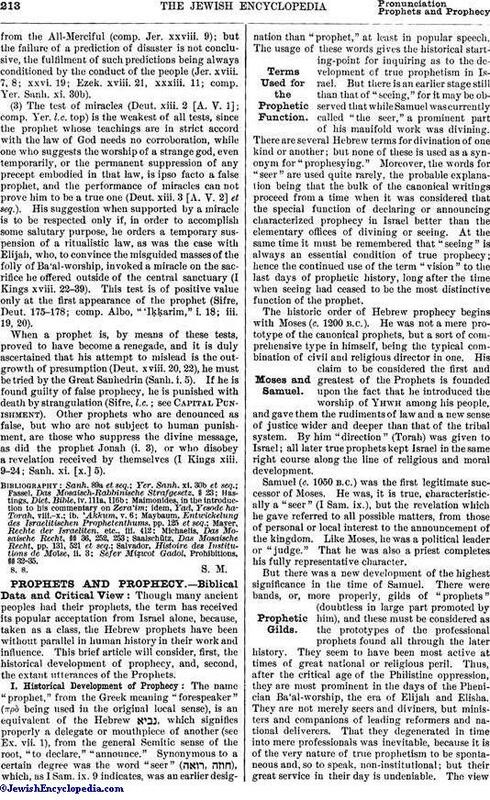 Deuteronomy is the only book containing laws concerning the false prophet (xiii. 2-6 [A. V. 1-5], xviii. 20-22). He is designated there as "prophet, or a dreamer of dreams," and it is in accordance with the former designation that the Talmudic jurisprudence provides that the subject of the charge of false prophecy must be one who is a consecrated prophet of God. The commoner ("hedyoṭ") who presumes to tempt people to idolatry is either a "mesit" or a "maddiaḥ," according as his followers are individuals or communities (Sanh. vii. 10; 67a; see Abduction). And in the same Scriptural dicta the Talmud discovers provisions against the following classes of false prophets: (a) one who presumes to speak in God's name what He has not commanded (xviii. 20); such a one was Zedekiah (the son of Chenaanah), who predicted in the name of God that Ahab would vanquish the Syrians at Ramoth-gilead (I Kings xxii. 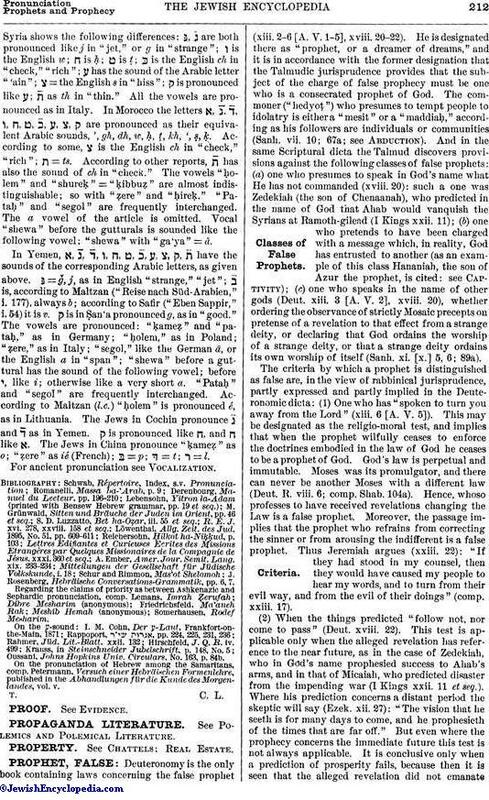 11); (b) one who pretends to have been charged with a message which, in reality, God has entrusted to another (as an example of this class Hananiah, the son of Azur the prophet, is cited: see Captivity); (c) one who speaks in the name of other gods (Deut. xiii, 3 [A. V. 2], xviii. 20), whether ordering the observance of strictly Mosaic precepts on pretense of a revelation to that effect from a strange deity, or declaring that God ordains the worship of a strange deity, or that a strange deity ordains its own worship of itself (Sanh. xi. [x.] 5, 6; 89a). (1) One who has "spoken to turn you away from the Lord" (xiii. 6 [A. V. 5]). This may be designated as the religio-moral test, and implies that when the prophet wilfully ceases to enforce the doctrines embodied in the law of God he ceases to be a prophet to God. God's law is perpetual and immutable. Moses was its promulgator, and there can never be another Moses with a different law (Deut. R. viii. 6; comp. Shab. 104a). Hence, whoso professes to have received revelations changing the Law is a false prophet. Moreover, the passage implies that the prophet who refrains from correcting the sinner or from arousing the indifferent is a false prophet. Thus Jeremiah argues (xxiii. 22): "If they had stood in my counsel, then they would have caused my people to hear my words, and to turn from their evil way, and from the evil of their doings" (comp. xxiii. 17). (2) When the things predicted "follow not, nor come to pass" (Deut. xviii. 22). This test is applicable only when the alleged revelation has reference to the near future, as in the case of Zedekiah, who in God's name prophesied success to Ahab's arms, and in that of Micaiah, who predicted disaster from the impending war (I Kings xxii. 11 et seq.). Where his prediction concerns a distant period the skeptic will say (Ezek. xii. 27): "The vision that he seeth is for many days to come, and he prophesieth of the times that are far off." But even where the prophecy concerns the immediate future this test is not always applicable. It is conclusive only when a prediction of prosperity fails, because then it is seen that the alleged revelation did not emanatefrom the All-Merciful (comp. Jer. xxviii. 9); but the failure of a prediction of disaster is not conclusive, the fulfilment of such predictions being always conditioned by the conduct of the people (Jer. xviii. 7, 8; xxvi. 19; Ezek. xviii. 21, xxxiii. 11; comp. Yer. Sanh. xi. 30b). (3) The test of miracles (Deut. xiii. 2 [A. V. 1]; comp. Yer. l.c. top) is the weakest of all tests, since the prophet whose teachings are in strict accord with the law of God needs no corroboration, while one who suggests the worship of a strange god, even temporarily, or the permanent suppression of any precept embodied in that law, is ipso facto a false prophet, and the performance of miracles can not prove him to be a true one (Deut. xiii. 3 [A. V. 2] et seq.). His suggestion when supported by a miracle is to be respected only if, in order to accomplish some salutary purpose, he orders a temporary suspension of a ritualistic law, as was the case with Elijah, who, to convince the misguided masses of the folly of Ba'al-worship, invoked a miracle on the sacrifice he offered outside of the central sanctuary (I Kings xviii. 22-39). This test is of positive value only at the first appearance of the prophet (Sifre, Deut. 175-178; comp. Albo, "'Iḳḳarim," i. 18; iii. 19, 20). When a prophet is, by means of these tests, proved to have become a renegade, and it is duly ascertained that his attempt to mislead is the outgrowth of presumption (Deut. xviii. 20, 22), he must be tried by the Great Sanhedrin (Sanh. i. 5). If he is found guilty of false prophecy, he is punished with death by strangulation (Sifre, l.c. ; see Capital Punishment). Other prophets who are denounced as false, but who are not subject to human punishment, are those who suppress the divine message, as did the prophet Jonah (i. 3), or who disobey a revelation received by themselves (I Kings xiii. 9-24; Sanh. xi. [x.] 5). Sefer Miẓwot Gadol, Prohibitions, §§ 32-35.